The 12 uniquely shaped quint pieces (pentominoes) lend themselves to an amazing variety of constructions. 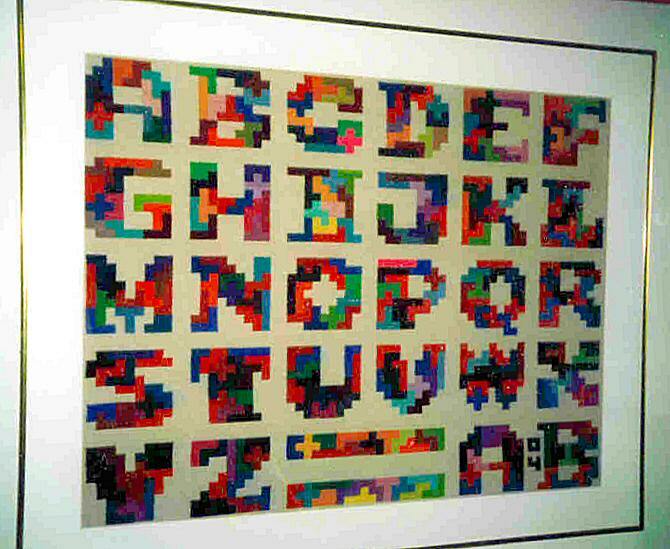 Kate designed this beautiful alphabet in 1983, assisted by Richard Grainger. It first appeared in Quint-Gram No. 7, Fall/Winter 1984, and is now part of the Quintillions booklet. Some of the solutions were exceedingly difficult to find, and we learned the reason a few years later, when a Japanese puzzler, Yoshio Ohno, sent us the full count of computer-derived solutions. The B, E, and J have a unique solution. G, K, M and R have only two solutions. N, S and X have four. The most numerous solutions are with I (254), Y (153), and L (442). All the others have 55 or less. This project gave rise to an expression that is now part of Kadon lore: "Just move the pennies." It's a shorthand way of saying that if something doesn't work, if you can't see your way clear to reaching an objective, change the conditions or redefine the parameters of the problem. How come? When we were working out this alphabet, we'd use pennies on the 9x12 Quintillions game grid to block out a shape. Each letter fit within a 9x9 area and had 21 unit spaces carved out of it to create its particular shape. The spaces held the pennies. We did a lot of moving before it was over. And we still use this technique to help visualize new designs. You can view five of the letter solutions in the Logo Movie linked from the large yellow W on our homepage. They spell out K-A-D-O-N. Chris Palmer did the Flash programming and jazzy animation in 1999. Chris also turned Belles Lettres into a font for computer graphics. See also needlepoints by Alton of Iamond Hex triples and Tetrahex symmetries.